A recent Pew study indicated a quickening decline in TV news viewership. 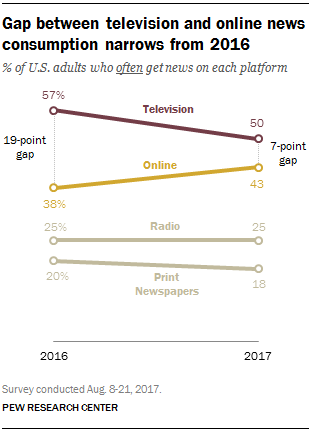 The research showed fewer Americans, including fewer older Americans, “often” get news from TV. According to the survey, local TV still has a larger pull than network or cable TV news, but local also experienced the greatest decline from last year’s survey. The widely shared report has been met with a mix of resignation and despair. But is the news for local TV stations all bad? RTDNA’s own research shows that, while fewer stations are originating local news, the amount of weekday TV news in hours actually hit a high in the last year, with more stations adding newscasts. Just this week, Telemundo announced 10 of its stations will be premiering an additional midday newscast later this month. But, as former RTDNA Chair Kevin Benz points out, “Stations are producing more newscasts because local production is cheap with higher payback potential from selling local advertisers.” In other words, more local news shows doesn’t necessarily mean a return of lost viewers. So what about the business side? The news isn’t all bad here either. Our latest research also shows that TV newsroom profitability is up, with more newsrooms saying they are showing a profit than have since 1996. The election year may have had a particular impact, but profitability has been trending level or up since 2010. So while the decline in viewers isn’t helping local stations, it doesn’t herald the impending death of local TV news. This is also far from the first time local news has been written off due to changing consumption habits. Just a couple of months ago, outlets announced the death of local news following the sudden closure of several local news websites. Take, for example, the 18 local TV newsrooms awarded Edward R. Murrow Awards in a new category this past year: innovation. Their work is bringing compelling, unique, and fresh approaches to news. Or see one of the most shared articles we’ve posted on our Facebook page in the last week, a look at RTDNA corporate member TEGNA breaking the mold of local news with new formats, new stories and new voices. Newsrooms may be profitable, but not enough to fill out your budget. Many newsrooms have been successful in trying new strategies and models, particularly taking advantage of your strength: localism. “ Provide the important information needed by the local community you serve,” says Benz, and deliver it to your audience when and where they need it. TV viewership may be down, but the need for strong local news isn’t. Innovating means taking risks, which brinks the possibility of failure, a legitimate concern but also a great teacher for leaders willing to experiment and analyze.